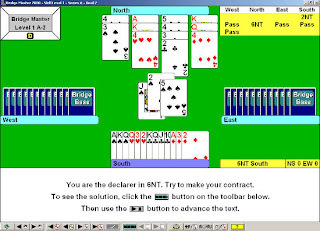 So South should start by winning the spade (of course), drawing trump, and cashing AKQ of hearts. If hearts are 3-3, thirteen tricks are easy - six diamonds, four hearts, two clubs and a spade. If East had the heart length, a double squeeze (my favorite!) comes to fruition. When you lead out all your trumps, West has to hold on to the king of spades, and East has to hold on to the long hearts, so neither can guard the club suit. As it is, West has the long hearts, so you have to play for a guard squeeze, hoping for split honors in clubs. When you run all your trumps, lefty is forced to hang on to the king of spades and the 13th heart--therefore only one club (hopefully the queen or jack). Lead a club to the board, dropping LHO's honor, and play a club to the ten on the way back!